“Please bring organic olive oil and flour if possible…” Having booked numerous accommodation suppliers over the years, I was impressed by this unique approach from Swasti Eco Cottages in Bali. After leaving Common Sense Organics with the Bali bound bottle of Moutere Grove Organic olive oil I looked forward to handing it over to the Swasti kitchen once we got to Ubud. Arriving at Swasti we quickly made a tour of the organic garden. The range of produce included turmeric, mulberries, egg plants, tomatoes and some Avatar lookalike goats. 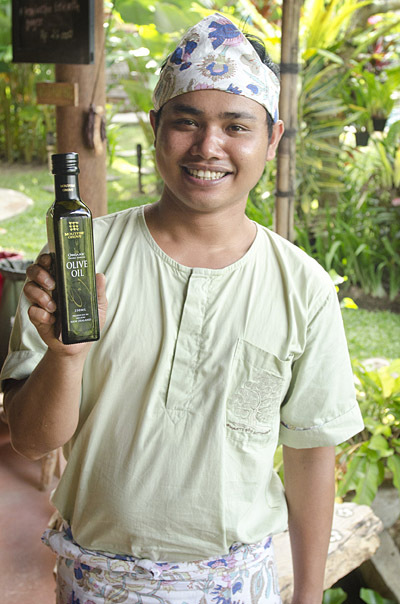 After a couple of days exploring the wonderful Ubud surrounds I finally got to photograph Pa Putra (one of the Swasti kitchen staff) holding the Moutere Grove oil in the dining room. In return for the organic oil we received two free desserts. Other highlights were the squirrels darting around the treetops, the frangipani flowers draped around our room, frogs croaking through the night, very friendly staff and the abundance of fresh produce on which we dined. However it will have to be the next visit for the 3 in 1 chocolate massage, black rice icecream or a special drink of organic raw cacao, banana and cashew milk. Although it was left behind the Moutere Grove Organic olive oil will feel right at home.